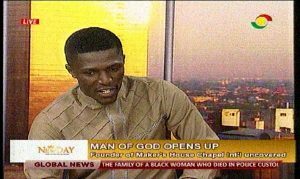 Dr. Michael Boadi Nyamekye was a guest on TV3’s New Day. There are several stories of medical doctors and other professionals metamorphosing into preachers of the gospel of Christ as the irresistible power of God calls on them. But in what appears to be a rather unusual transmutation, a Ghanaian pastor, Dr. Michael Boadi Nyamekye, a trained pilot, has abandoned the cockpit for the pulpit. With a doctorate in Business Administration, Mphil, other academic credentials and now a PhD Business administration (Marketing Option) candidate at the University of Ghana Business School, Dr. Michael Boadi Nyamekye, General Overseer of the Maker’s House Chapel International, said he was inspired to study to become a pilot through video games. Although he is not practicing as a pilot after pumping thousands of dollars into it, he says he is content and has no regret for heeding to the call of God to impact lives on the pulpit rather than in the cockpit. “Standing behind the pulpit is my calling; that is to say that if God had not called me to do that, I would have had many things to do but that’s the grace that God has placed upon me to be impactful and to talk to people from the pulpit not just in church but even out of church. So piloting might be like a hobby I pursued because I wanted to. I didn’t have any background or interest in that initially; but later on when I started playing video games; flying and doing all those things I just said why not? And for me, I don’t have many friends and so when am bored I pick up a course”. Appearing at the guest on TV3’s Uncovered, a segment of New Day on Wednesday, the man in his late 30s with four kids in a marriage of ten years, told the Host Nana Aba Anamoah that he became born-again in his teens in his secondary school days after being considered a notorious student through his rapping and other activities. A view of ‘The Maker’s House International Chapel. “I was a bit notorious in school leading all the bad stuff that you wouldn’t want to be associated with now. I was once stripped of my position as the head prefect. I responded to an altar call by some missionaries who had come to our school and that was how the calling started. People were shocked and didn’t believe I could stay in the faith”. His ministry has seen international recognition in many parts of the world for over a decade now. And being an astute intellectual, he is very well sort after to speak in conferences all over the world on a broad range of themes. Having served under great men of the gospel, the name and blue print of The Maker’s House was given to him by the Holy Spirit in 1998, but stayed in the incubator until October 2011 to be hatched as a fellowship. The Maker’s House has grown ever since testifying of the Lord’s goodness and grace. 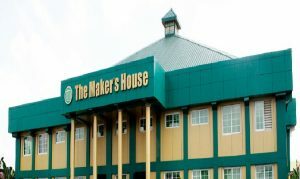 The Maker’s House is one of the fastest growing churches in Ghana today. As a firebrand preacher; full of revelations and insights, he operates in a variety of gifts as the Holy Spirit permits but goes under the flagship of the prophetic ministry. He is a “word addicted” and therefore preaches the word of God passionately. Despite his impeccable academic record, Dr. Michael Boadi Nyamekye says he owns no company because that in his view will be a distraction to his service to the church and the flock. The father of four however noted that he impacts knowledge by offering consultancy services, serves on the boards of companies and institutions; something he earns enough money from and enjoys doing. “I don’t want to get a company of my own because I will get distracted so all the knowledge I have acquired is not going waste at all; I am using them in another form” he stressed. Addressing a number of issues in relation to Christianity today and ministry work particularly in Ghana, Dr. Boadi Nyamekye bemoaned the trend where some persons claiming to be pastors are using dubious ways that do not conform to the Bible to deceive and to fleece the gullible flock. He however did not agree entirely with the suggestion that most pastors were enriching themselves at the expense of the flock explaining that there are basic principles for believers to pursue to become prosperous as God wishes for them; but many were failing to do so. He noted for instance that in his church, there is never an attempt to burden people with financial demands; adding that giving as the Bible teaches must come out of a cheerful heart. He says his teachings are also focused on things that will make his followers prosperous beyond the basic requirement of attaining salvation. He disagreed with suggestions that his magnificent place of worship located at Kwabenya in Accra, is perceived to be reserved for an elite class of people in society making it difficult for ordinary people to worship there. According to him, that’s only an exaggeration; insisting that although English is the only medium of communication due to the presence of foreigners amongst others, it is always open for people from all walks of life whether rich or poor. Commenting on the issue of homosexuality and its abhorrence or acceptance, Dr. Boadi Nyamekye said Christians appear to have failed in defending what the Bible clearly says about the act and rather resort to using the argument of morality. According to him, just as the religions such as Islam and Buddhism amongst others clearly abhors the act, Christians must be bold to resist it as stated in the Bible. He is however of the view that such persons are assisted to overcome their weaknesses rather than being discriminated against. On the issue of whether or not churches should be taxed, Dr. Boadi said per the company’s code, churches are non-profit organizations and can therefore not be taxed. He indicated that churches are also contributing meaningfully to society not only by shaping moral values and providing spiritual needs but also through the building of schools and hospitals amongst others. He however believes churches need some form of regulation in order to deal with the excesses that emerge from their dealings. On the issue of corruption in Ghana and the role of the church in taming the menace, he said inasmuch as the church cannot insulate itself completely of blame, it would be unfair to tag the church as not having the moral capacity to talk about corruption. He says some churches are teaching the right values but people are simply not changing. Dr. Boadi believes corruption is simply a choice, adding that it does not matter whether one is rich or poor he or she can still be corrupt. “If people are going to be more sacrificial to put the state first and any other thing secondary, I believe that we will be able to get off this headache”.